I decided to do a music review of this album as it was my introduction into the relatively unknown music genre of Folktronica – an offshoot of electronica – which mixes traditional folk or world instruments with electronic sounds to create a chilled and interesting sound. I bought it the year of its release, 2003, and still find myself coming back to it on occasion almost 10 years later when the search for something new or unique is fruitless, and this can be said for only a very few album’s I purchased back then. 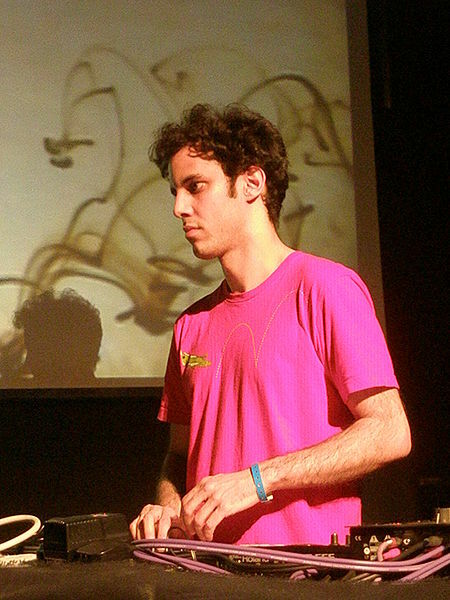 Four Tet is the stage name of Kieran Hebden, a musician from London who produced his first solo release as Four Tet in 1997. With a wide variety of musical style influences, including hip hop, electronica, techno, jazz, and folk music, he has developed a distinctive sound and has been described as a post-rock musician but the album Rounds is more a serving of Folktronica for those looking for something electro, chilled and with a bit of soul, which is very much lacking in the majority of chill-out music available. For me, four tracks and their melodies stand out prominently among the rest. These are ‘Hands’, ‘She Moves She’, ‘My Angel Rocks Back and Forth’ and ‘Unspoken’. The intro to the album starts with a heart beat recording, apparently taken from a dog and recorded for a film about veterinary studies, immediately drawing the ear to want to know what will happen next. I gives an immediate insight into the freedom of sound selection Four Tet possesses and his ability to blend the seemingly un-blendable. Over the beat comes a rush of percussion with plenty of cymbals and a jazzy flavour, but there simply is no rhythm to put your finger on in an exact sense. This first track, ‘Hands’, seems almost chaotic due to this flurry of percussion, yet is perfectly contrasted with subtle increases in intensity and rests in the beat, coming together nicely to compliment the main melody while sounding completely out of time but feeling totally in sync. The face out from ‘Hands’ brings dissonance and draws you into a space of silent reflection after the chaos. ‘She Moves She’ is a beat driven track, but when the sitarlike melody begins to play, the beats almost feels like it slows down and step to the back of the stage. Filling the sitar -like melody out are soft subtle chimes which bring to my mind pictures of Tibetan Tingsha bells and high-pitched wind chimes. The electronic, robot like overlay is the dominant factor on this track and somewhat takes away from the soothing melody, but none the less the track still compels the ear even when it seems to be in a repetitive rut, slight and timely shifts are made to maintain the interest enough for the ears tune in to the end. ‘My Angel Rocks Back and Forth’ is undoubtably the pinnacle of the album, with a repeated melodic phrase reminiscent of a sweet lullaby, that to the mind feels so familiar, like its name rests on the tip of the tongue, yet simultaneously feels freshly unheard and unearthed. The overlays of melody are created with a classical guitar sound on top and a harp sound underlying this, thus demonstrating the beauty that is possible when two stringed instruments close in pitch compliment each other. The first thing that comes to mind when hearing the beat is ”breathing through the mouth”, and I immediately think of Darth Vader. This effect breathes life into the beat, creating a quality of being alive and human-like, making it more accessible to the heart than a flat electronic beat. Besides the melody the other distinctive section is a breakdown occurring almost exactly in the middle of the song. As the melody and beat get ready to reinstate themselves it is led in with a wonderfully delicate accordion like piece, paving the way and then offering a hand to the melody and beat as they wait for the perfect moment to re-enter. Once again the subtly of build up is so silent that there is barely a trace of what has been added or manipulated so that before you know it you are at the climax which ends as quickly and as effortlessly as it started. All up, a gorgeous track that bundles together the fleeting nature of childhood innocence and incites a solemn reminiscing of that time long forgotten in the life of the modern, responsible adult. The final standout track ‘Unspoken’ is easily distinguished by its piano melody lead, giving it a classic ‘chill-out’ feel for the melody, but the beat, specifically the use of a tambourine, breaks the mould of classic ‘chill-out’ and along with the chiming of bells giving the song a unique flavour of its own. A short and sweet, looped clean guitar lick takes the lead as it builds subtle excitement and a chaotic, out of tune – out of time, bowed instrument enters signalling a shift away from the relaxed, retrospective mood and entering into a mode of activity and anticipation of reaching the summit of the song. But the summit never truly arrives, and just as you feel it should, the piano melody delivers the ambient chill found in the beginning, bringing the song full circle. ‘Unspoken’, finishes where it began, with an ending that once more incites a reflection upon life dreams, trials, struggles and purpose. Among the other tracks there are many which are throughly enjoyable, all up making this a well-rounded album, easily listened to from start to finish without the urge to skip anything. It’s the type of thing I like to play as background music on a warm, quite night with incense burning and a good book in hand, or simply to compliment a little star-gazing when the sky’s are clear. Rounds, produced in 2003 is Four Tet’s third album and since he has produced many more but this one sits comfortably above them all as his masterpiece. It was voted as the 123rd best Album of the 2000’s by Pitchfork Media and is also rated highly on other well know music review sites except Rolling Stone, where it received 3 out of 5 stars, which to me illustrates the bias towards specific mainstream genres Rolling Stone tends to have. If I had to give one criticism it would be the overuse of the beat driving and dominating certain tracks, but I’m sure this was part of an attempt to move the album away from the “chill-out” genre and breathe a liveliness into it as without the strong beats, especially the break-beats styles used, the whole album could easily be digested as an ode to depressive, inactive states of being. This is hands down my favourite electronic instrumental album thus far, as it creatively mixes the use of some of my favourite traditional stringed instruments with sampling techniques producing a distinctive sound unlike anything else I’ve heard and as a musician is great inspiration for blending eclectic music styles in order to create something new, something fresh, unique and intriguing.